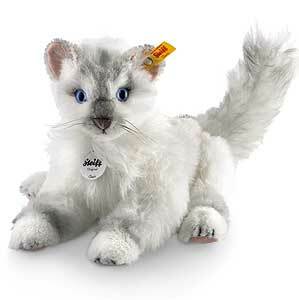 Chari Masterpiece Cat is from the Steiff Classic collection and made in beautiful white alpaca with airbrush painted markings around face and paws. This wonderful Cat is a yellow tag edition and wears the famous Steiff Button in ear. Chari cat is, 5-way jointed so the arms and legs are loosely jointed so she can be posed lying or sitting up. Synthetic and steel pellets filling. 38cm long with length of tail included.